To make liquid soap by the half gallon the easy way, just follow this simple recipe that uses no dangerous ingredients or special equipment. Basically, this recipe changes hard soap into liquid (gel) soap with the addition of glycerin and water. I’ve tried a number of liquid soap recipes from the internet that didn’t work and finally, out of frustration, devised my own. This is my own original recipe and it does work! This recipe makes just under half a gallon of general purpose liquid soap. It is best made in the evening, as it will need to cool overnight before the final stage of blending the soap. Mix soap flakes, water and glycerin together in a large saucepan over a low heat. 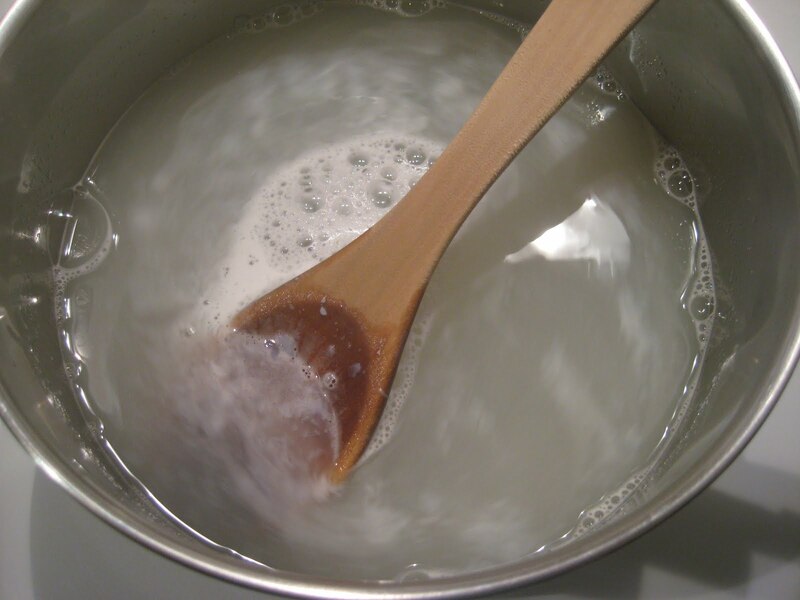 Stir occasionally until the soap flakes have dissolved and the mixture is smooth in texture. Let cool overnight until room temperature. 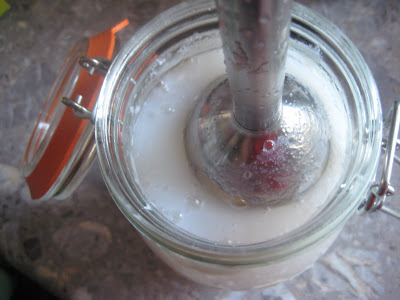 The mixture will be slightly thick and milky-looking, with a jellylike texture. (I usually pop it into a sealable jar for cooling). Blend with a stick blender, electric mixer or handheld egg beater until smooth. Store in a sealable glass jar or pour directly into whatever containers you prefer. If you choose to make a thinner (runnier) recipe, just add more water. Making a thinner recipe will also make it more economical. A thinner version might be a good idea for a hand pump in a child’s bathroom, for example. The liquid soap is suitable for hand pumps or body washes. Liquid soap is great for general-purpose cleaning around the house. Just add hot water and away you go! My husband also uses this liquid soap instead of expensive shaving foam, which irritates his skin and is not sustainably packaged. This mix is absolutely safe for children and pets, and safe for septic tanks and composting toilets. 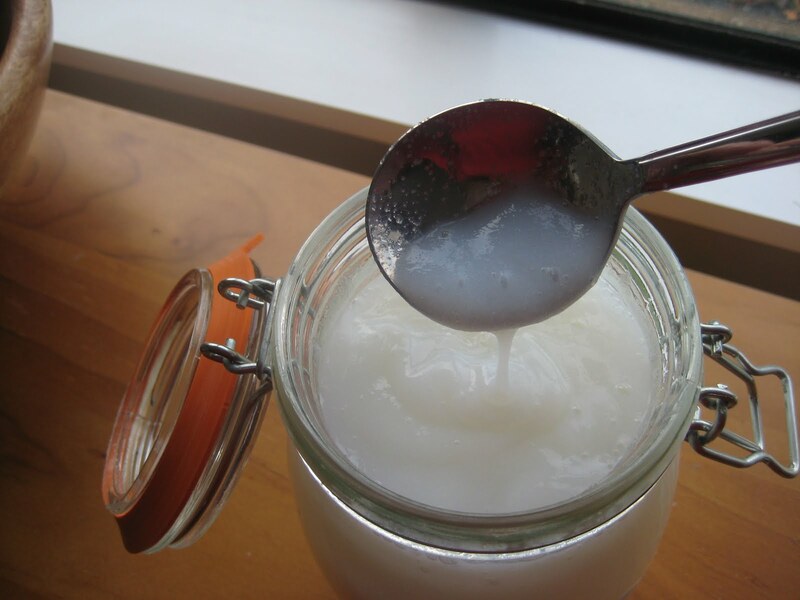 Because you’re not working with such toxic ingredients as caustic soda, which is used in soap manufacture, this recipe is absolutely safe to make with young children in the home. Just be wary not to let children near the hot stove, of course! You can choose to add scent to this mix if you want although I prefer not to. Just be aware that some essential oils, such as peppermint and lavender, are skin sensitizers or allergens that can cause problems for some people. 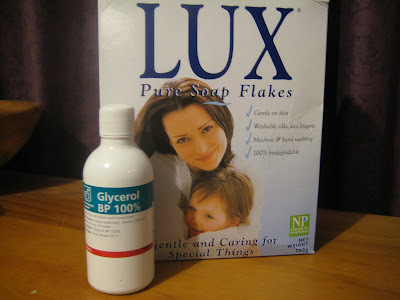 Soap flakes: For my liquid soap, I used Lux flakes, which are plain soap flakes commonly available in New Zealand. You can also use a plain grated bar soap. 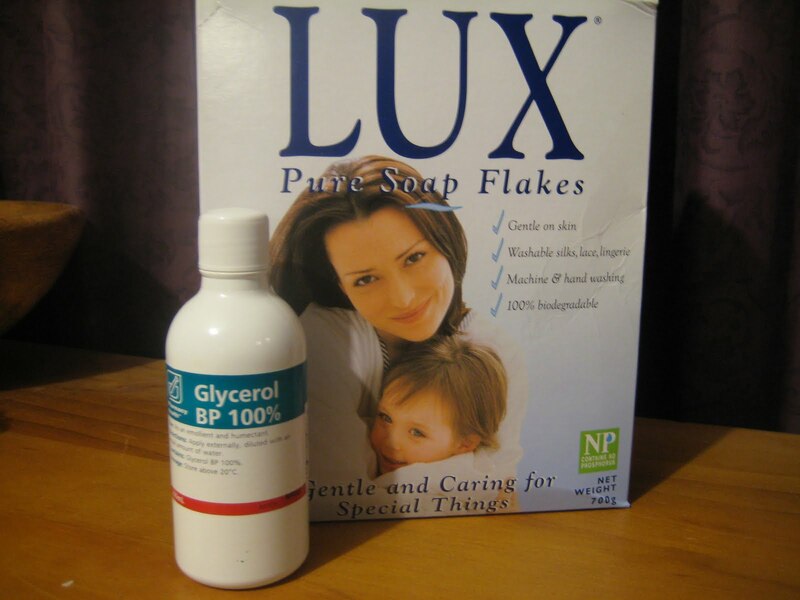 Lux flakes do have a mild perfume added, but this does not affect the gelling of the liquid soap at all. Glycerin: Glycerin is available in most drugstores and vitamin stores or yo can buy it online atÂ Amazon. It is also known as glycerol or glycerine. 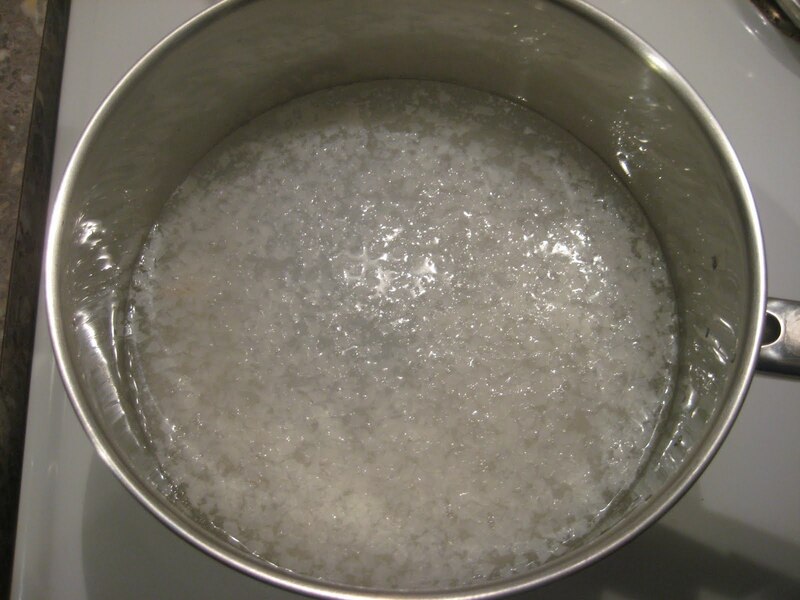 Water: You do not need to use distilled water for this recipe. Tap water is fine. The total cost of making this recipe came to about about $1.78 for about 64oz. of liquid soap.